The main objective of this Task was to assist with developing a strong and sustainable market for solar cooling systems. It focused on systems including any solar thermal cooling technology (no power limitation or solar collector field area) that can be used in heating mode. 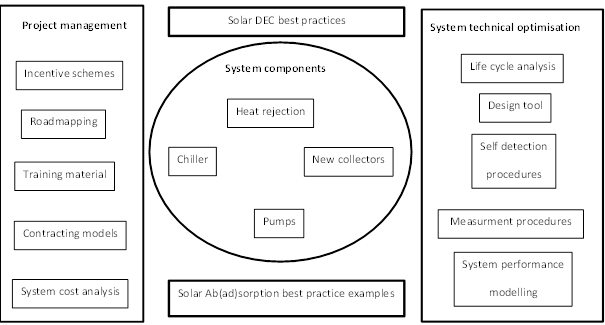 The project built on the IEA SHC work already carried out by working to find solutions to make solar thermally driven heating and cooling systems efficient, reliable and cost competitive. The main results of Task 48 are conceptually represented below. Click on a box to go to the report on that topic.